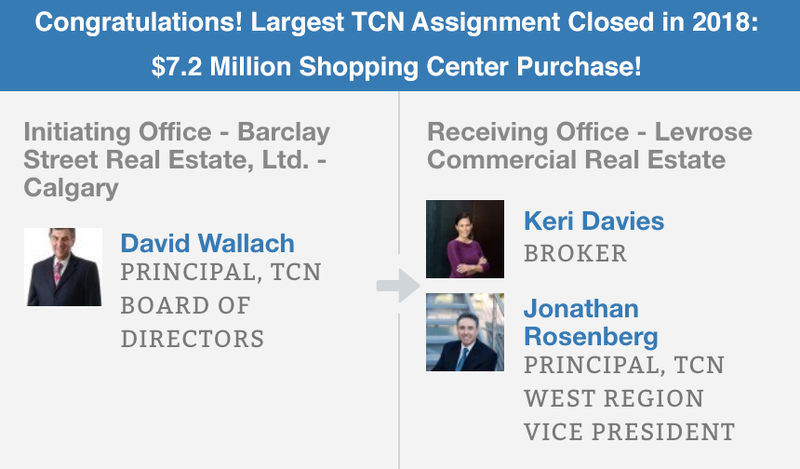 Congratulations to Barclay Street Real Estate/TCN Worldwide in Calgary and Levrose Commercial Real Estate/TCN Worldwide in Phoenix on completing the largest TCN assignment closed in 2018 based on total value, a shopping center purchase for $7.2 million! Congratulations to David Wallach at Barclay Street Real Estate in Calgary, who initiated the assignment, and Jonathan Rosenberg and Keri Davies at Levrose Commercial in Phoenix on the completion of this transaction! Commercial Property Executive: A new Integra Realty Resources report suggests that commercial real estate could get caught up in the volatility of the stock and commodities markets. Hugh Kelly, PhD, authored the IRR report. Yardi Matrix: Welcome to Yardi Matrix’s first monthly report on the office property market. The reports will feature Matrix’s U.S. office data, which covers a wide range of data points—including leasing, development trends, transactions and more—on 6.8 billion square feet of office properties in 115 markets across the country. National Real Estate Investor: NRF forecasts retail sales will increase by 3.8 percent to 4.4 percent in 2019, below 2018’s level. TCN Update: Did you miss last week's Commercial Focus newsletter? Check out these top TCN member deals for Q4 of 2018! TCN Update: We are proud to announce Cost Segregation Services, Inc. (CSSI) as a sponsor. CSSI is a national leader for the application of engineering-based building studies that deliver tax savings for commercial property owners to improve their ROI. Member Announcement: Starboard Commercial Real Estate is pleased to announce agent Frank Vella's election to the San Mateo Association of Realtors (SAMCAR) Board of Directors. Vella ran and was elected to the board for the position of Government Affairs for San Mateo County. Moody Rambin/TCN Worldwide in Houston Announced the Completion of Two Lease Transactions. Member Deal Announcement: Wealth Enhancement Group has leased 4,966 square feet at 1800 West Loop. Ryan Fassett and Josh Marcell with Moody Rambin represented the tenant. Next Level Urgent Care has leased 4,283 square feet at 5718 Westheimer. Ryan Fassett and Josh Marcell with Moody Rambin represented tenant.